Tag line: "Unrest in Peace"
Right off the bat, let me state for the record that The Gravedancers is not a perfect movie; there are problems at the very beginning of the film (the story gets off to a slow, not to mention predictable,start) as well as the very end (the final few minutes are downright goofy). But any and all weaknesses present in The Gravedancers are ultimately overshadowed by a handful of very inventive, very creepy moments, which are held together by three of the most fascinating ghosts you're likely to ever come across. As the funeral for an old friend of theirs is winding down, college buddies Harris (Dominic Purcell), Kira (Josie Maran), and Sid (Marcus Thomas) decide to drive back to the cemetery to give their deceased pal a “proper” send-off. After a few hours of heavy drinking, Sid spots a black envelope leaning against their friend's headstone, inside which is a poem about the joys of life. In their drunken stupor, the friends follow one of the poem's instructions, and dance on several nearby graves. But they soon learn the error of their ways when, over the course of the next several weeks, all three start to experience strange phenomenons, some of which are violent in nature. 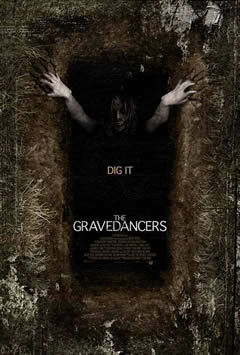 In desperation, they turn to a pair of paranormal investigators, Vincent (Tchéky Karyo) and Frances (Megahn Perry), who conclude that the poem Sid found in the cemetery was, in fact, a curse, and that the spirits of those whose graves the trio danced upon have returned to seek their revenge. As the ghostly attacks grow ever more intense, the three friends must resort to extreme measures if they're to have any chance at all of surviving this frightening ordeal. As I stated above, The Gravedancers doesn't get off to a good start. For one, the scene in the graveyard, where the friends “dance” on the graves, feels a little awkward (probably because none of the three leads are particularly convincing as drunks). Also, their first few “encounters” with the supernatural are about as routine as you can get (While installing an alarm system, Harris hears piano music coming from the other room. Of course, when he investigates, there's nobody sitting at the piano). But all that changes the moment Harris' wife, Allison (Clare Kramer), has a run-in with a truly frightening ghost, one that seems intent on doing her harm. All at once, events in The Gravedancers begin unfolding at a rapid pace, leading up to what I feel is the film's best sequence, where we learn the identities of the spirits "haunting" the three friends. To avoid spoilers, I won't go into too much detail, but I will say that the back stories of the various apparitions are fascinating, to say the least. From there on, I couldn't wait to see how the rest of the story would play out, and with the exception of the ridiculous ending, The Gravedancers lived up to all my expectations. Imperfections aside, The Gravedancers is a very entertaining horror film, and while many of the ghostly scares won't be among the most original you've ever seen, the ghosts themselves, pent-up hostilities and all, will more than make up for it. @Figorino: Thanks so much, and I agree, it's a shame to see it end! However, stay tuned...there may yet be ONE MORE SHOW in the works (if, for no other reason, than to give Planet Macabre the proper send-off its excellent fans deserve). Thanks again, and please...STAY TUNED! Figorino: Yes, absolutely serious (and yes, Billchete will be back, as will all the original Macabre hosts). Look for it on its usual day! And thanks again for the support. It is truly appreciated. No Horror movie today (Thursday) Dr per your schedule? I am excited to hear this wrap up episode!!!!!! @Jeanie: There actually WAS a horror movie posted today (THE HOUSE WHERE EVIL DWELLS), but because I had a wrong tag on it, the movie didn't show up under the 'horror' category! It's been fixed now. Thanks for letting me know. I'm actually surprised I didn't hear about it before this! And yes, it looks as if the wrap-up episode will be a fun one! Thanks again for letting me know the movie wasn't posted properly, and for listening to Planet Macabre. Wasn't this part of the first set of Eight Films to Die For series? I remember it being one of the few that I enjoyed. Good review, it'd made me want to watch this again. Yes, this was part of the initial "8 FILMS TO DIE FOR" series, and while it's not a perfect movie, I also liked it. Thanks for the kind words, and enjoy the movie! I actually thought the piano bit was creepy. I mean, Chopin's work is haunting on its own. I agree that the set up of the movie was a little odd. Slow and quiet in the first act, then balls to the wall crazy later on. Kind of like Insidious, now that I think of it (just watched that one, so it's fresh in my mind). I actually really enjoyed this one. Better than a lot of the 8 films stuff.